This device is a fuel saving and pollution reduction retrofitting modification that has been featured on the Panacea Fuel saving and pollution reduction page .Please check that page for more fuel saving and pollution reduction modifications. The term "Hydroxy" is exclusively an open source FREE energy engineering term in origin and refers to oxyhydrogen production.The oxyhydrogen is produced from an electroyzer which comprises electrodes immersed in electrolyte and water. This system is intened to operate as as a hydrogen on demand process. Hydroxy is a mixture of hydrogen (H2) and oxygen (O2) gases, typically in a 2:1 molar ratio, the same proportion as water. This gas is some times abbreviated as "HHO" or "Hydroxy Gas". Hydroxy is also referred to as Brown's gas. Yull Brown first received patents for his electrolyzer process in 1977 and 1978. However it is understood that this gas was first discovered by William A. Rhodes in 1966. Using hydroxy boosters is a method to improve the burning efficiency of any Petrol, Diesel and LPG/CNG powered internal combustion engine or generator. Testing has shown greatly reduced emissions, removal of engine and exhaust carbon deposits, improved torque, power and increased fuel economy. This is due to the system helping to complete the burning of the vehicles existing fuel and extract the already available energy. The unit produces just the right amount of hydrogen catalyst to blend with the existing fuel source, enhancing the combustion of fuel from helping to incinerate fuel toxins and particulates. This creates a cleaner air exhaust discharge. 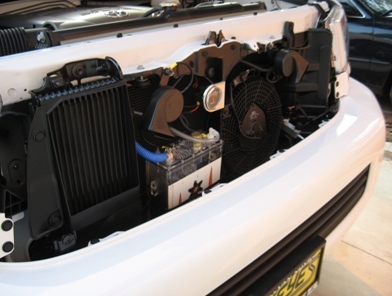 A typical hydroxy retrofitted system uses the electricity from the vehicles battery and or alternator to produce the hydroxy gas.The system is installed in a vehicles engine bay and the gases are fed into the vehicle's air intake system. Other hydrogen on demand boosting systems split the gases and produce pure hydrogen and not "hydroxy" which is a mixture of hydrogen and oxygen. One such system is featured below. 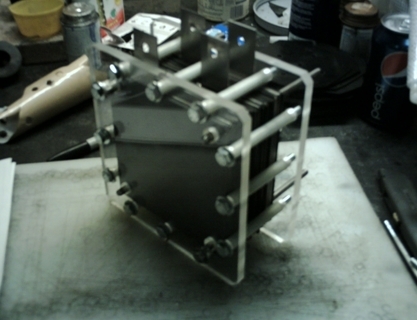 The Gas splitter HYDROGEN Dry cell by Open source engineer Bill Williams. "Effect of Hydrogen Enriched Hydrocarbon Combustion on Emissions and Performance". There are other methods of hydrogen production which remain non mainstream or in public applications to capacity. by Tadahiko MIZUNO. Ã, Tadashi AKIMOTO, Kazuhisa AZUMI. 1, Tadayoshi OHMORI. 2,. Yoshiaki AOKI . Note- Hydroxy boosters which are made with stainless steel electrodes have been shown to produce Hexavalent Chromium, any electrolyte water from these boosters must be disposed off under the EPA rules and regulations. Do not pollute the water ways as hex is a known carcinogen. A special procedure that's needed to condition stainless steel electrodes has been donated to the public by Bob Boyce. This procedure is listed in the Panacea university hydroxy course and must be followed to ensure not only efficient production but prevention of Hexavalent Chromium. MMO coated Titanium substrate material (Ti/MMO) boosters have been shown to be safe and not produce Hex. Hydroxy boosters made with MMO coated Titanium substrate material have also been shown to produce a good % of "ORTHO HYDROGEN " which is understood to be needed for fuel savings. Reference Smacks Boosters (Please consider supporting his effforts) Smack has also shown that they generate no harmful products such as hexavalent chromium. See Cr6 water test heres. The current emissions are only in effect due to the UN NECESSARY CONFIGURED TECHNOLOGY. Hydroxy boosting vehicles improves the combustion of the fuel. This performs the function of ESSENTIAL "corrective surgery" and enhances the inefficient and polluting internal combustion engine (ICE). Thanks to our Sponsor PKW performance in Sydney Australia. The non profit organisation showed Hydrocarbons reduced by -67.2%. Carbon monoxide reduced by -19.2%! Hydrocarbons (un burnt fuel) are responsible for cancer and attack the human liver. CO (carbon monoxide is TOXIC. IMAGINE THE WEST WITH 67% LESS HYDROCARBONS AND 19% LESS CO! This can be done today with the implementation of hydroxy technololgy. Panacea's generic system improved fuel economy by at least 15%. This was accomplished by using a basic hydroxy booster system, much more gains are possible.Not only can up to 67% of the hydrocarbons be reduced.By a simple 20-25% fuel saving in a country like the United States gasoline consumption could be reduced by 800 billion gallons before any hydrogen fuel cell or electric vehicles make a significant impact. That is a 20 billion barrel reduction in oil consumption. An MIT study showed that If average fuel efficiency of a US fleet of cars and light duty vehicles is increased by 20%, yearly fuel savings would be 25 billion gallons of gasoline (equivalent to 70% of oil presently imported from the Middle East). Facts and figures from modern open source designs can be made into a report to show the feasibility. Rebates could also be applied from government based on how much pollution you reduce much like carbon credits.These results are needed to be presented to your local pollitican on record. We need to penetrate the mainstream audience and show how boosters can reduce the carbon foot print and save fuel. Based on the fuel savings alone the council and government can now make use of this technology to save the tax payer money on fuel. Also based on the pollution cutting attributes, this technology warrants, rebates, carbon credits, endorsement and subsidies for its supplementation. Note - In this report they used what some consider to be a dangerous (toxic) and inferior design. More details on this "water4gas" design that was used in this report has been included below. Despite the report showing a below average design and did not focus on the pollution cutting attributes of the technology. The police department (a government agency) is actively using hydroxy gas enrichment, and reporting positive results and no complications. Perhaps one of the most over due triumphs of the reality of hydrogen on demand technology is Ronn motors sportscar the scorpion. This is now factory manufactured with an on board water electrolyses hydrogen on demand system. The Scorpion from Ronn Motor Company has an internal combustion engine burning both petrol and hydrogen, achieving 40 miles per gallon (about 5.9L/100km) on the highway.During the extensive research and testing, Ronn Motors reports that they have optimized emission reduction and performance. This occurs when fuel savings are in the 15% to 22% range. Depending on a number of variables, hydrocarbon emission reductions will be as high as 90%. Even if a low cost electric car reached the market place TODAY, it would still take the existing infrastructure an average of 5 years to change over all their technology to the new one.The proposed fuel standards as far away as 2020 (more info below) can be reached TODAY. Hydroxy is one of the lowest cost modifications which can be implemented to all existing vehicles to cut their carbon foot print. Please READ that again. "A high school drop out" detailed how he makes cars and celebrities cars more energy efficient. If a high school drop out can do it, how does that justify billions to the car companies!. Do they deserve it? NO, a substantial amount can be applied to what we already have to stop pollution and improve MPG in cars NOW. Hydroxy is one technology which can achieve these goals TODAY. Yet there are no subsidies, endorsments or carbon credits which are currently assigned to this technology. Recently we installed a Water fuel for all booster on a Diesel truck. 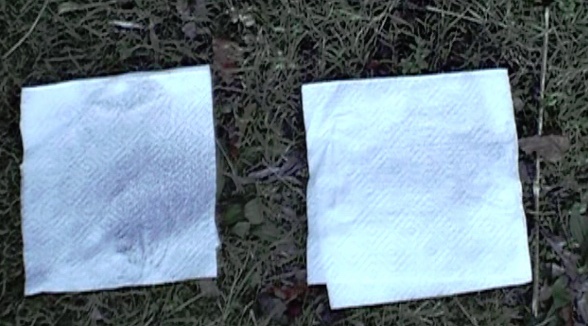 Take a look at the before and after paper towel test. We held the paper towel up to the exhaust. The left one is the black one with out the booster, the whitish one is with the booster turned on! Diesel emissions are the most carcinogenic and more harmful then nicotine! Is this the air we want our kids breathing in? Left is with out the booster turned on, right is with the booster turned on. Our tests showed a decrease or elimination of exhaust emissions, lowering the carbon footprint. There is a great deal of benefits and income that can be generated by carbon credits by this technology. Using hydroxy gas can reduce these emissions, also in a different gas generating configuration hydroxy gas has been applied in a stand alone case to run a car or generator with out the need for any fuel, and completely remove all fossil fuel emissions. Reference - More advanced configurgations. Quote-Hydrogen injection works because it greatly increases the speed of combustion. It has nothing to do with the added energy or BTU's. Because hydrogen ignites easier and burns many times faster than gasoline, when added to the combustion chamber it causes the gasoline to ignite faster and burn completely. Without hydrogen injection gasoline is ignited by the sparkplug about 10 degrees before the beginning of the combustion stroke and is still burning when the piston reaches the bottom of the combustion stroke. The remaining unburnt fuel is then sent through the exhaust to the EGR system to be recycled or to the catalytic converter to be reburnt (wasted). With hydrogen injection the combustion starts much faster, this is why you need to retard your initial timing when using it. When the hydrogen is ignited it burns very fast and in turn ignites the gasoline from all sides at once. The pressure wave created by the combution has a shorter duration pulse and is more energetic because of the complete burn. Since the all of the energy is released when the piston is near the top of the combustion stroke more energy is absorbed by the piston and captured as work energy. Less energy is lost as heat in the exhaust. There is no unburnt fuel so EGR systems and catalytic converters are not needed. This is why when adding a hydrogen injection system you notice more power and you need less pedal to get the same results. How long have we known this? In 1918, Charles H. Frazer received a patent for "hydro-booster" He found that hydro boosters work best with low grade fuels. Why have Hydro-Boosters since been ignored? Why are they still suppressed? 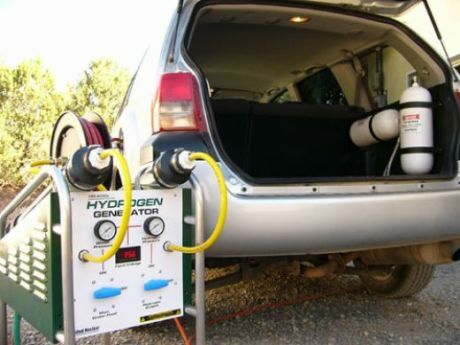 A hydro-booster is a step in the right direction towards a 100% oxyhydrogen fuel system. This is another reason why they are not mentioned or used in huge scale.-Source. The first USA patent of a hydrogen/oxygen generating cell to be used in conjunction with the ICE (internal combustion motor) was granted in 1918, to Charles Frazer. 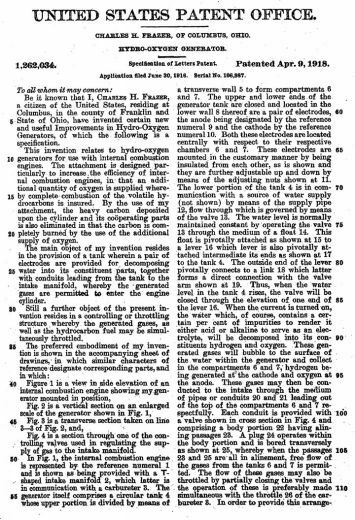 Mr Frazier described it as a device added to the ICE motor, to increase efficiency, eliminate carbon deposits and improve horsepower.WHY hasn't this patent and knowledge been used since? Is it because it can improve fuel economy? 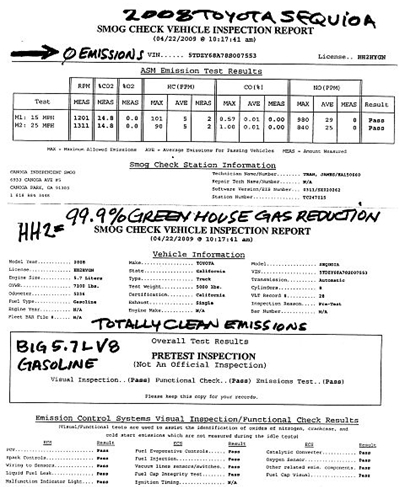 This patent has citations listed in which clearly shows that big oil and car makers have known since the 1970's how to give cars better fuel economy, yet today they are not doing it as standard with boosters or hydroxy hybrid units. This smoking gun document was Published by: Soc. Auto. Engrs.,New York SAE Meeting; 12-16 Aug 1974; SAE Preprint 740600. 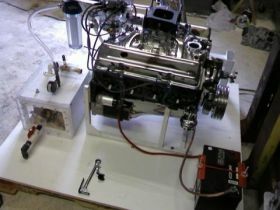 "On-board hydrogen generator for a partial hydrogen injection internal combustion engine" This Shows they have known how to make hydroxy boosters and have been aware of its benefits. "On-Board Hydrogen Generator for a Partial Hydrogen Injection Internal Combustion Engine", and F.W. Hoehn and M.W. Dowy, also of the Jet Propulsion Lab, prepared a report for the 9th Intersociety Energy Conversion Engineering Conference, titled "Feasibility Demonstration of a Road Vehicle Fueled with Hydrogen Enriched Gasoline."-End. Plus this document clearly shows the knowledge and benefits for converting Hydro diesel engines and how to cut their emissions by 80%!. Further there are over 200 fuel reforming patents owned buy oil companies, auto makers, high tech companies and individuals. Many of the patents include the data from testing fully developed and proven systems. And we haven't even covered the more efficient spark plug technology or the "Bios Fuel" 50% water and waste oil emulsification method which can also decrease emissions and improve fuel economy. Sorry or water injection (engines) AND the fuel vaporization technology. It is understood that the U.S. Government owns at least 5 patents for fuel vapor systems. Whilst also the Oil companies own at least 15, and car makers own at least 94. Oil company profits have been at an all time high. They are the most powerful financial entity on the face of the earth, do you think for one moment they are obligated to care about you in any way? The U.S government gets around $6 in taxes every time you fill up. If by using a simple hydroxy booster or a fuel vaporizer you only had to fill up every 3 months, instead of every week, do you think the bureaucrats are going to give up their goose that lays the golden egg, YOU the consumer? Above is the Bios fuel completing the Panasonic world solar challenge with their 4WD powered by 40% water and 60% waste oil! If you do, there is information you should know. There are 920 patents related to better fuel economy, reduced emissions and alternatives fuels since the 1920's which have never made it into the public hands. We also havent mentioned that even since 1947 this Tatra T87 had aerodynamic features that resulted in less drag on the road thus better MPG. Only several thousand of these cars were built. 1947 Tatra -Reducing air drag gives better MPG! To top it all off "The Avion sports car was developed as a lightweight and aerodynamic and very fuel-efficient sports car. 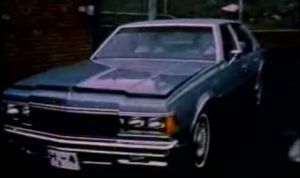 The prototype was completed in 1984 and set the Guinness world record for fuel economy in 1986 at 103.7-mpg average driving from the Mexico border to British Columbia Canada border. 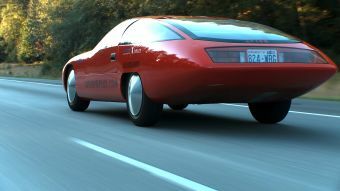 The 100mpg aero dynamic Avion sports car car made in 1984! Craig Henderson of the Avion Car company has been struggling for years to get this technolgoy out there, they should not have had to suffer these hardships especially when they have an environmental solution. Recently they passed all the tech review and business plan for the X prixe but we did not want to spend the money on insurance for a contest sponsored by a Insurance company and rules written by Tesla battery cars. Craig is currently forced to use the money they would of had to of spent on the x prize towards building the next Avion for sale as a kit car. A skilled garage tinker could assemble it in one week end and we expect it to cost $23,000 USD. If you can support their efforts please contact them.It seems the grass roots level is the only way to beat the monopoly and suppression. Where is the LAW to help enforce these fuel efficient and "aero dyanmic" standards today? There is none and further of concern. Car makers continue to seek tens of billions of taxpayer dollars, ostensibly to develop fuel-efficient vehicle technologies, but their conduct is evidence they are reluctant to embrace solutions they didn't invent. Using hydrogen blended with a tiny bit of nitrogen (Ammonia) for a fuel has been around since 1981.Greg Vezina calls his technology "hydro fuel". This technology is cleaner and cheaper then Petrol. 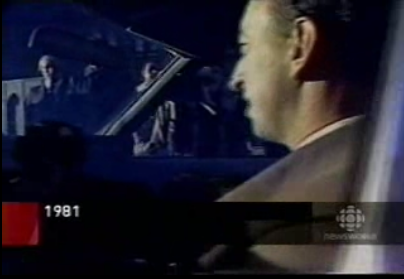 Greg showed his car running on "hydrofuel" to the energy minister for the day back in 1981.
minster riding in the "hydrofuel" car. A news report stated that the minister took it for a spin and said he liked it, so did the governor general, all and all vezina thought he had a winner . 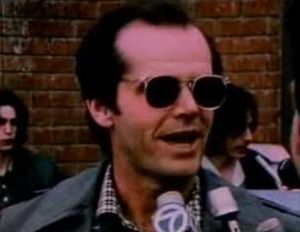 Shortly after his appearance on parliament hill back in 1981, interest on his idea all but disappeared , Veszina speculates that this was a result of the government owning Petro Canada.As of today in 2010 the technology is still not in use. Greg is still unable to get support for his technology over in Canada. However we are affraid that this problem is far worse then what has just been described. 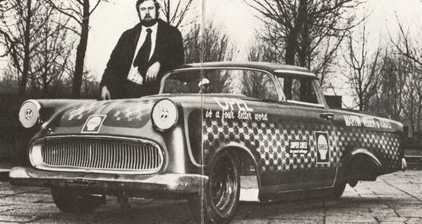 Yes you have read correctly, the above shell opal test car got 376 miles per gallon.Reference That was in 1973 where is it today? Hydroxy booster technology, Air compressed motors, the Solar Taxi, electric vehicles and the GEET technology can all produce less to NO emissions and give better fuel economy then regular gasoline vehicles TODAY and NOW. our Panacea at Greenfest Video production. Please review Panacea's fuel saving Vehicle modifications document for both a legal and practical way to address this situation. Consensus reality are unaware of the severity of past suppressed improved fuel economy technology. Why would a multi trillion dollar industry give up its potential greed?. Human nature has a history lesson for you, given the chance greed will over ride any collective benefits. Disinfo and lack of support continues to slow slow down the technology. 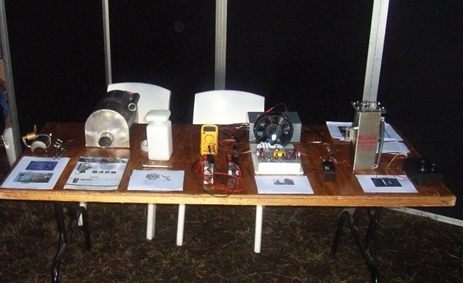 Recently IN 2008 a public hydroxy "Rally" was conducted in the USA by open source engineers. This was done in order to show case PUBLICLY the OPTIONS AND ADVANTAGES TO USING HYDROXY FUEL SYSTEMS. Of the twelve newspapers contacted about the hydrogen booster rally passing through their local area, only one emailed an inquiry about it, but never followed through with an interview. 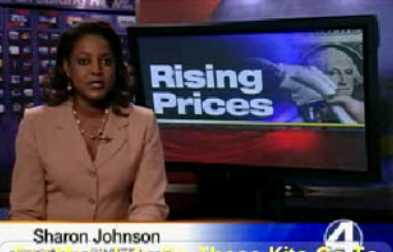 Keep in mind that the time the rally was conducted and when the 12 newspapers were contacted it was the highest priced petroleum was ever,(it has since risen and droppedl). Don't you think a newspaper would tell their readership that an available technology can help? It is up to the community to act. Most media programs are no better, recently Myth busters provided a "take" on similar themes where they misrepresented this technology. Their segment neglected many key factors which is necessary to operate the technology both efficiently and reliably. Their "version" used no catalyst in the water, plus also left out a safety bubbler. Conclusion- A poor representation of the FACTS and capacity of the technology in general. Third party reports given to the none profit organization state that the car companies have been "in bed" with the oil moguls since the turn of the 20th century. If you just do your research you will find this to be true. Aside from the numerous carburetors that resulted in gains in excess of 100 mpg, you will discover that GM had a prototype back in the early 1930's that got over 300 mpg, the Pogue carburetor got over 200 mpg, and Toyota had a prototype in 1972 that got over 200 mpg. More than 900 patented vaporization carbs from the 1960's and 70's got between 60 and 80 mpg. Once the oil producers reformulated gasoline, it would gum up the carbs after a very short time and cause the carbs to fail. It wasn't the vaporization carbs that were the problem. It was the "devious" corporate inspired cartels who wanted to sell the maximum amount of gasoline to an unsuspecting public. All of this is part of the public record. In the late 1970's one of the country's greatest mechanics, Smoky Yunick, developed a 4 cylinder hemihead offset injection engine so simple that virtually any backyard mechanic could repair it. It more than doubled a car's mileage, met and exceeded California's 1990 emission standards and increased horsepower by around 40% for the same displacement. While all of the 3 BIG U.S. car companies expressed an interest in it, they all ultimately ignored it. In 2008 am open source engineer went to the Washington, D.C. Car Show. There they showed the latest in "high" mileage hybrids. The best of them got 35 mpg on the highway. The engineer then compared his car, which is a 1999 Saturn 1.9L which gets 35 mpg on the highway. So who's fooling whom?. The car companies want you to pay an additional $8,000-$10,000 more for a hybrid that gets no better mileage than the example of an el cheapo Saturn. And you still believe that the car companies are genuinely interested in developing high mileage cars? Pay close attention to the historical records and you'll learn the truth about the century or more of deception perpetrated by the auto companies. Watch the movie 'Who killed the Electric Car'. Get educated and you'll find out the truth about the masters of deception. made 100% hydrogen powered car. where is this company today , what happened to the technology? There is barely a trace of this concept left. Currently a company called United Nuclear is the only known promoter of such a renewable hydrogen process, however they have been stooped by the government from production. It has recently been alleged that that the corrupt U.S. government has swooped in by utilizing its consumer product safety commission (CPSC) as a means of suppressing the pending commercial sale of United Nuclear’s Hydrogen Fuel System Kit. This was done by confiscating the necessary chemicals used in this system from public use – possibly basing its action on false premises. A quote from the United nuclear web site - "LATEST NEWS, April 27th:Instead of moving forward with our research, 100% of our time and money is now being spent on fighting a legal battle with the U.S. Government. Some time ago, the CPSC (Consumer Product Safety Commission) recruited the SWAT team and other Government agencies to raid our facility confiscating all papers, plans and computers. The record with vapourizer technology is no better. 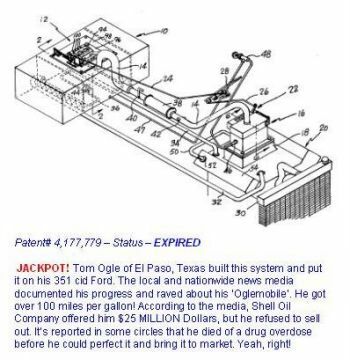 Check US patents 3,961,616 ,4,00,905, 4,011,843 ,4,336,783, 4,742,684 to name a few.One of the most talked about was the pogue's carb he was bought over by the oil companies. He went from being an impoverished mechanic to owning a company manufacturing air / oil filters for the US big three companies!! check his patents. Most the the vapourizers wouldnt work as well as they should could the oil companies have started lacing it with additives which thwart the vapourization of these fuels? It is alledged that they started doing this after their stocks crashed when the 200 MPG Pogue carby was announced and demonstrated.The Pogue carb was based not only on vaporization, but also catalytic conversion of the fuel. It is suspected by most that lead was put into gasoline to prevent this catalytic cracking of the fuel molecule.When catalytic converters were first introduced, lead was taken back out of gasoline and the gasoline was reformulated. There are also too many 100% water powered car systems which have been suppressed to mention on this page. What? 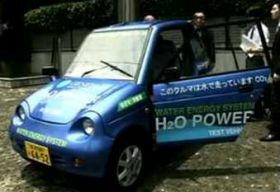 think 100% water powered cars are not possible? There have been many others, modern ones include Steven Ryan from Bios fuel (now they are not offering a 100% water powered system any more ask your self why?) , Xogen, (suppressed) and Meyers (suppressed) to name only a FEW. This is more solid proof that Water fuel car science is not going to be ignored now. This will also justify the case for getting engineers taken seriously working on the Meyer's and Bob Boyce method of water powered technology. Today it still remains a little known fact by the majority of the public that hydroxy boosters can stop pollution RIGHT NOW and save them money on fuel, whilst in the mean time other suppressed and alternative energy can be further developed. Currently the best low cost booster is the water fuel for all booster, Karma booster or te Smack's booster which all can with stand 10+ hours of driving. Other efficient designs are possible. All these units are listed in open source detail on the Panacea university site under the hydroxy course. A unit such as the the water fuel for all can be easily built at relatively low cost and installed in a vehicle NOW to improve MPG, save money and cut pollution There are dangerous deisgns out thee and some do not work. PLEASE NOTE! DO NOT USE THE WATER4GAS BOOSTER OR ANY THING SIMILAR -MANY ENGINEERS HAVE STATED THAT THIS BOOSTER NOT ONLY IS AN IN EFFICIENT DESIGN BUT ALSO WILL PRODUCE TOXIC GAS! 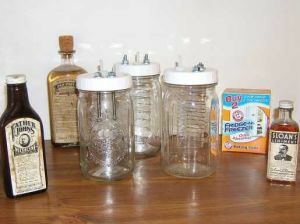 A glass jar containing wires wrapped around pieces of plastic, and filled with baking soda is DANGEROUS electrolyzer! 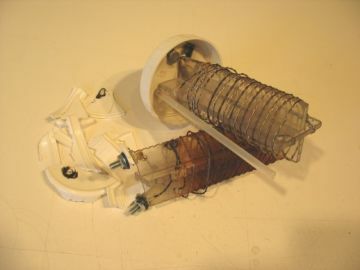 Below is the end result of using one of these jar/wire/baking Soda units as an electrolyzer. Please note! -BUYER BEWARE! -The buyers of any hydroxy technology advertised for sale must be aware of certain designs which are dangerous. Currently certain designs are being advertised which not only do not produce the needed efficiency for an adequate boost, but will also produce toxic chlorine gas due to the wrong choice of electrolyte(baking soda). The following program has featured these designs in an attempt debunk the whole science. Fox TV program- Can You Really Convert Your Car to Be a Water-Burning Hybrid? They neglected to feature the numerous proven scientific studies which validate hydroxy boost technology.You have to ask yourself also how qualified this guy is to think that 99% of your fuel is burned out of your exchaust. Did some one put them up to simply using an inefficient and dangerous design in order to attempt to give the impression that ALL boosters are the same? What? You do not think that energy suppression can exists? Regardless Myth busters and both these news reports appear to some one who is unqualified to make an assessment a certain way - And he/she gets manipulated. Please stay away from the designs featured in those news reports. Safer hydroxy booster designs are featured below and in the Panacea university hydroxy course.There are a lot of wild fuel improvement claims being made by many who are selling boosters. Beware of booster scams! Stick to the proven open source designs included on the Panacea university site under the hydroxy course. The installation of a hydroxy booster is completely reversible and does not need to effect the cars warranty. The hydroxy booster technology is reusable, you are able to install it and reinstall in any of your future cars. This system over time pays for itself in fuel savings. On top of saving money, improving gas mileage, horsepower and lowering emissions, every time you fill up your tank, you will not be giving money away un necessarily to oil corporations. * Decrease pollution -IMPROVE PUBLIC HEALTH. *Carbon credits may apply in other countries. There are over 400 million cars in the USA at this moment, more in other western countries. Practically NONE have these devices installed. Very few car owner have the expertise to build their own units. Most of the general public own these cars and are people which are not mechanics, they are school teachers, doctors, and businessmen people who don't have the time and knowledge to build a unit. This is why a body of individuals need to take the initiative and start a company that will produce AT LOW COST at least 200,000 units per year. Panacea has also conducted an installation video which can be forwarded to help train local mechanics. Currently the open source engineering communities are the only ones presenting their designs at LOW COST, others have an unfair prices attached given the materials and given the importance of dissemination of this technology. The public are currently stuck with few cars that get 70 MPG, and the other 99.9% will be getting 18 MPG. A NONE PROFIT ENTITY (such as the public's non profit Panacea organisation) is needed to ENSURE A LOW COST PRODUCTION and open source release of these units. This is also required in order to put the revenue BACK into open source engineers research and development which is aimed at publicly disclosing more efficient water powered technology. Not only this, given the many fuel reforming and pollution cutting devices available NOW, it further needs to be mandated that all vehicles have one device or another fitted to cars to stop pollution. Science correspondents, and motoring correspondents all need extra items of interest from time to time, and a simple, cheap device which cuts vehicle pollution instantly to zero, has to be of interest to them. There is no "weird science" or breaking of conventional engineering or science theories involved in understanding this technology, so there is not the slightest danger to the correspondent personally for publishing this kind of information. If public interest were to be boosted by the media, then it would make it difficult for hydroxy boosters to be suppressed. Once the awareness and credibility of hydroxy boosters is established publicly, then it is only a small step to running on hydroxy on demand from water as in stand alone cases or with electric hybrids with out fossil fuels towards cheaper and cleaner 'free-energy' generally. One the the next steps in advancing this technology onvolves using the Bob boyce method of hydroxy gas production. Above is the Bob Boyce electrolyzer. Bob has done his own experimentation. Bob discovered that with the right frequencies, he was able to generate monoatomic hydrogen and oxygen (hydroxy) which when recombined, produced about 4 times the energy output of normal diatomic hydrogen (tank hydrogen)and oxygen molecules. This he explains is since the process of combustion does not have to break apart the molecules first before recombining into water vapor. Diatomic hydrogen requires about 4% to air to produce the same power as gasoline, while monoatomic requires slightly less than 1% to air for the same power. This makes hydroxy gas practical towards boosting cars for better fuel economy and as towards a stand alone system to power vehicles. There is however issues to deal with concerning modern cars oxygen sensors, these can be addressd by using an "electronic fuel injection enhancer (EFIE). Further reports have shown that post 1971 vehicles in the US have the cam timing deliberately set ten degrees retarded in order to waste fuel. These issues can be resolved and are explained in detail in the Panacea university hydroxy course document. Politicians are needed to get on board, a hydroxy or hydrogen supplimentation campaign will be beneficial for them, people are also needed to forward this data to their local members. So please participate.Panacea has a video production that YOU can send to politicians in order to show these pollution cutting devices and to GET THEM ON RECORD. STOP PAYING HIGH PRICES FOR FUEL! Demand that these fuel saving devices are LAW for a fuel saving and pollution cutting standard. Currently they are not being used to save the tax patyer money. Panacea wishes to offer some suggestions to politicians as to the most effective way of progressing these aims. These suggestions are based on the results of efforts made in the past, and are intended to help politicians succeed where others have failed. There are various obstacles which need careful handling.Elected politicians would already be aware how to present ideas but perhaps considering the following points might be helpful in these efforts. The public in general have been taught from an early age that you need to burn a fuel in order to produce energy - wood and coal on an open fire, electricity to boil a kettle of water, gasoline to run a car. These ideas are repeatedly supported by "scientists" who the general public look up to as being "cleverer" than they will ever be. While this thinking is not correct,for decades has been carefully fostered by the government in spite of the oil companies being fully aware that alternatives exist. Each year, literally hundreds of devices are suppressed and we are talking here about magnet-powered vehicles, vehicles running on water, self-powered compressed-air electrical generators for home use, devices that are functioning as open systems which can pull kilowatts of electricity out of the environment and which need no fossil fuels to run. There is no regulation at the federal level committing grants and security into harboring the manufacture of this suppressed alternative energy technology. The current mandated laws do not prevent a corporate cartel based influence or government sponsored by them from making or creating difficult economical or political conditions to suppress this environmentally sound technology and further harbor their own profit motives. They can also simply buy the patent off the inventor and shelve it, there is no law preventing them from this. The reason for this suppression is selfish power and money. The vested interests of oil revenues where a single company makes Millions per hour profit are a massive obstacle to the ordinary person. Add to that, the massive government income from taxes on oil products. Panacea's records of energy suppression listed on the FREE energy suppression page show that the people trying to introduce free energy technology and any information related to it are facing the opposition of governments, oil companies, courts, army, police, CIA, patent NSA, Patent offices and world banks. This opposition has been very successful for decades now. 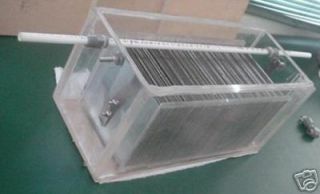 It is necessary for engineers dealing with this type of technology which has political and economic conditions to have their own PUBLIC grant backed research and development center tailored specifically to alternative and suppressed energy, to advance education create a public land mark to build awareness, consumer demand and to create social reform. These devices need to be manufactured and made available to the public in large numbers. This requires finance from somewhere.Philanthropic foundations have funds and when consolidated with others can provide grants to the non profit organization who have engineers with the capacity to advance education and create security. Cartels and the richest people are opposed to it because it would reduce their power over the masses and reduce their current excessive profits. Also due to past energy suppression the mainstream faculties have been literally institutionalized in dogma and are conditioned against free energy devices. If one was to publish that unlimited energy could be had without burning fossil fuel, the brainwashed scientist and public could immediately write you off as a "crank" with no grasp of reality, so this is something which needs to be considered and to be avoided at all costs.There is one slight window of opportunity available at the present time. Currently global warming is being publicized as being caused by harmful emissions and CO2 is named as the major culprit. What is correct to say is that emissions are harmful and regardless we ARE be better off if we dealt with them. Zigouras Engineering's 100% Hydroxy test unit. Consequently, there is an opportunity for politicians to start the introduction of free-energy devices to the public.We can start with a device that is non-controversial to the mainstream and operates inside the presently accepted "scientific" dogma. This device is called a "hydroxy booster". It consists of a small container of water, variations of it include the addition of and electrolyte added. This container of water has metal plates in it. 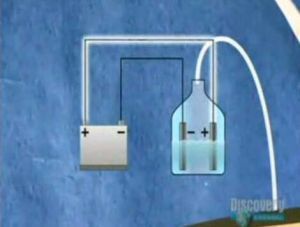 When an electrical current is passed through the water hydroxy gas is produced. If that gas is added to the air being drawn into an internal combustion engine, it improves the quality of the fuel burn to such an extent that all harmful emissions disappear completely (and a catalytic converter is not actually needed). For modern fuel injected cars, currently a circuit called an "EFIE" (electronic fuel injection enhancer) is needed to be added in. This is because modern cars need to make sure the on board ECM does not inject more fuel due to the new oxygen content passing the oxygen sensor.It is illegal to tamper with the cars on board emission management systems. It can be proven that hydroxy cuts the emissions down, so technically this is not having a negative effect on the ECM’s ability to manage the cars emissions. However politicians are not aware of this. 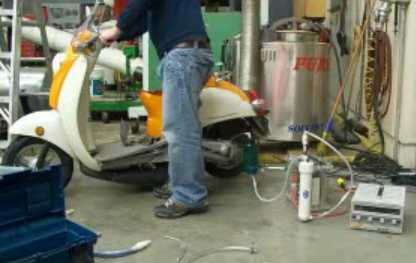 Also the EFIE has been exclusively created by open source engineers.A dyno and emission test with the EFIE/Hydroxy booster has already been done to prove its ability to stop pollution.This has to be used to pressure politicians to endorse them in rebates to help cut the carbon foot print. 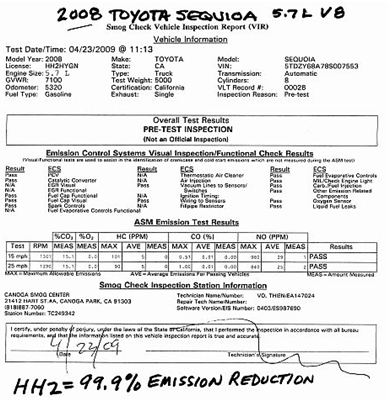 There is no justification to make the EFIE illegal.The following emission test was performed by Peter James and showed a reduction of hydrocarbons (unburned fuel) by using a hydroxy booster in conjunction with an EFIE device. Pictured left are the results from using the EFIE. Pictured right are the results with out it. You will notice that on the left it reads the "HC" (hydrocarbon) result with the EFIE to be 38 ppm (parts per million). On the left with out the EFIE the "HC" result was 64 ppm. This is nearly half the pollution. John has showed that he can produce less polluton then a brand new stock car. Yet despite an EFIE device and a hydroxy booster being proven to be able to produce a better emission management then the cars brand new factory settings, it is still CURRENTLY illegal to put an EFIE device on your car at this time and people in the state of california can be fined for producing less emissions then the factory ones by using the EFIE/Hydroxy booster! THIS IS A HYPOCRISY, POLITICANS MUST AMEND THIS LAW AND WE MUST CREATE PUBLIC PRESSURE. Hydroxy technology is be proven to decrease or eliminate exhaust emissions, lowering the carbon footprint. There is a great deal of benefits and income that can be generated by carbon credits. For both a legal and practical public solution to address this, please consult the Panacea University’s fuel saving vehicle modification document. For non enigneers who wish to purchase the EFIE. Panacea endorses and supports covert auto engineering for EFIE's. Open source engineers put all revenue back into open source FREE energy research. However ifyou use the open source Bill Williams dry cell gas splitter or the following s EFIE is not needed. Derek from the company HydroLectricPower LLC has produced the HH2 system and has done exceptional to get CARB approval for this system. CARB EO D-643 Legal. This was possible because the HH2 Hydrogen cell creates Hydrogen and Oxygen separately from each other and will require no modification to the vehicles pollution management system. The two gases never recombine to form explosive gases.The CARB approval standard is accepted world wide, this is a great victory for the boost community, why hasn't it been in place since it was proven by NASA in the 70's?. Government vehicles and city council vehicles could of been running with less pollution and a reduced tax payer fuel bill since the study was conducted why are they not today?. Derek conducted a HH2 fuel economy test with a Malibu Canyon big V8 Sequioa The EPA sticker reads normmaly it gets 15MPG. With the hydrogen HH2 hybrid system the average city mileage recorded is 22-24 MPG using regular 87 octane fuel. Also a nice cleaner air exhaust is present. The following dyno and emissions report is nothing to take lightly look at the pollution figures. 1. Initially, the legislation to make the fitting and use of these "pollution cutting" devices to be legalised in all countries. 2. Then mandatory fitting of these devices to all new vehicles and attractive incentives or rebates for their usage. If the politician sticks to a campaign of "cutting pollution" by a low-cost, practical device for existing vehicles, then he/she is assured of success and can justifiably enhance their own standing in the political arena. 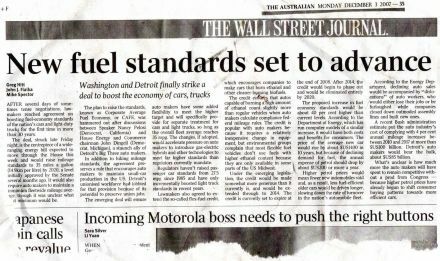 Recently political legislation came in regarding new fuel standards. This legislation is an energy bill which calls to raise the fuel standard to 35 miles to the Gallon by 2020. This article states that there is ONLY justificiation for the technology to prevail in 2050! Further more the DOE has offered $400 million for transformative technologies, hydroxy hybrid technology is not in there. Further -USED CAR DEALERS can be contacted about the topic of their cars being fitted with technology to give them better fuel economy by a NASA proven lean burn OPEN SOURCE hydroxy system. = MORE SALES. If you are a used car sales man or some one who can hep this effort please contact us. Bob Boyce runs the the main Hydroxy technical support group.Currently these groups (more are listed below) are the web presence for a group of experimenters who research using hydroxy and are interested in replicating reported results. The 'work ethic' of these groups are dedicated to the concept of total disclosure in order to get the information out with easy to follow, step by step, no fail plans that anyone can follow and duplicate and verify our results to create their own free-energy solutions. Like the concept of the proposed granted non profit Panacea research and development center this group is dedicated to the concept of total disclosure, easy-to-follow, no-fail plans and information for the Do-it-yourself element of society to provide their own energy solutions. The hydroxy group efforts are aimed at verifying and replicating claims made by others using water as fuel for powering vehicles and generators. This research and development needs a grant backed environment, recognition, support and publication by the mainstream academia. The proposed granted Panacea research and development center is the most realistic way to operate at capacity and get this information out to people, so that the information will be widespread and thereby can not be suppressed. Panacea feels that the open source hydroxy community research and development plays a key part in these efforts and will further pledge input as a public face to help advance their education, security, resources and grants towards their efforts. For current engineers wishing to experiment, technical support and is available in the current internet based forums listed below. Despite the hydroxy research groups having a working available device, their scientific find has no faculty recognition, and they are further unable to get faculties to present and accept these findings. Currently Panacea's affiliated open source engineers Jake Wall and Dustin need funding to progress this research. Jake is planning to pursue a PhD degree in mechanical engineering. Dustin is planing on helping with the grant proposals to include need gas quality studies and combustion research. Both Jakes and Dustin's grant proposal can be forwarded on request please Contact Panacea. More scientists are needed to follow up and study this unique gas that has many applications. Besides combustion enhancing in engines, the Neutralization of Radioactive Waste is a huge field that is still unexplored. The Neutralization of nuclear waste can also effectively address drought problems, this is another neglected and not widley known area of research. There is something very special with "Brown's Gas" that scientists have not studied over the last 50 years, thinking and assuming that its the same as mixing H2 & O2 gases. Christopher Eckman has been turning heads for a couple of years now in the free energy community with his academic studies and tests on Brown's gas at the University of Idaho. He proposes a model in which the H2O molecule in Brown's gas actually becomes linear and electrical in nature. In the linear form, it loses its dipole and thus can exist in gaseous form which Eckman dubs "electric steam". The dipole is the primary means by which water adheres to things, including itself in liquid form. When the 'electric steam' is ignited and strikes the substrate, it is the electrical energy that is released and is responsible for the heat transference to the substrate, not the temperature of the actual flame that does the work. Liquid water can be seen dripping off of metal substrate. Dr. Rhodes and Professor Brown never had the opportunity or equipment to analyze their HHO gases like Christopher Eckman currently has access to. This field is still wide open for further research. - More research in general, who knows what more could be found! The hydroxy research groups contributions need a grant backed research and development environment to flourish and will be submitted into faculty study in the proposed granted Panacea research and development center. If you're a member of the public , philanthropic grant foundation or a scientific group which can aid in grants for the center or help the hydroxy research groups please contact Panacea. For those who have no technical ability and wish to persue hydroxy boasters please consult the following web pages for already available assembled units. Note- In Panacea's opinion ALL of the web sites beside the open source ones who are currently selling hydroxy products have a far too high price listed for their units. This opinion is based on the price of the individual materials needed to make up the unit- which can be obtained far more cheaper individually. Please look into the feasibility of construction of the following boosters which are listed FREE on our online university. You can also seek technical support on the internet based forums listed below. A kit can be also be purchased and a qualified mechanic can install it. Please use our install video, this can instantly train mechanics.If you are unable to make the booster and wish to purchase an assembled booster, the following boosters have been done by open source engineers who intend to use the revenue to advance the technology and remain dislcosing their research and development FREE as public knowledge. Please support their efforts, their designs are not only the most efficient, but the LOWEST cost. Assembled boosters for sale:The following is a Panacea endorsed list to support their open source disclosure. PLEASE CONSULT PANACEA'S ONLINE UNIVERSITY FOR CONSTRUCTION DETAILS AND COMPLETE FACULTY KNOWLEDGE AND INSIGHTS INTO OPEN SOURCE HYDROXY TECHNOLOGY.